Christie Boxer 4K30 is a 30,000 lumen, 4K resolution, 3DLP projector designed for high impact live events. With intelligent design and feedback, Christie Boxer 4K30 is the most profit-focused professional projector in the market that will help you deliver an unprecedented user experience time and again. 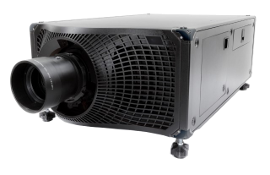 The Boxer 4K30 ensures a low cost of ownership, increases your return on investment, and future proofs your fleet – in the smallest, smartest and most efficient 30K projector available. Featuring six-lamp Mercury illumination, the Christie Boxer 4K30 provides 1,500 hours of lamp-life to 70% brightness. With the added benefits of single-phase power, built-in warping and blending, omnidirectional installation options, a full-range of connectivity and Christie TruLife electronics, the Christie Boxer 4K30 packs a punch in creating powerful and inspiring visual experiences.